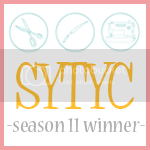 I was asked to do a guest post last year for Missy over at So You Think You're Crafty. She was in between competition seasons and needed a few pre-holiday filler posts. It was so much fun! And my first real introduction to her great blog. I have been asked several times since then about this little guy and realized I never re-posted the tutorial here on Craft Goodies. Well the timing couldn't be better to do so, so let me introduce you to my 4x4 No-Melt Snowman! Tell me that doesn't make you smile? Even better he was super quick and easy to put together. Start by painting the blocks. All body pieces white, the hat and square base pieces black. Once they are dry, rough them up with your sandpaper. Remove any dust. Using the wood glue to hold everything together, start making your snowman. Glue the hat pieces together, being sure to center the block piece onto the square piece and set aside to dry. Glue the body and head pieces together, centering each block onto the larger on below it then set aside to dry. Once the body is dry, you're going to drill the holes for the arms. One on each end of the "shoulder" block drilled on an angle so the arms don't stick straight out! From there you're ready to make your snowman yours. I set the twig arms in place with a hot glue gun, and then painted the rosy cheeks. The nose came next, it's a small wood rectangle cut from a paint stick, and last I drew on the eyes with a sharpie. Once I had my face done I glued the hat into place and finished dressing my snowman. I used a scrap of fabric for the scarf and matching ribbon for the hat band. Some fun wood stars painted black down the front instead of buttons and then some other fun odds and ends to give him a little more personality. 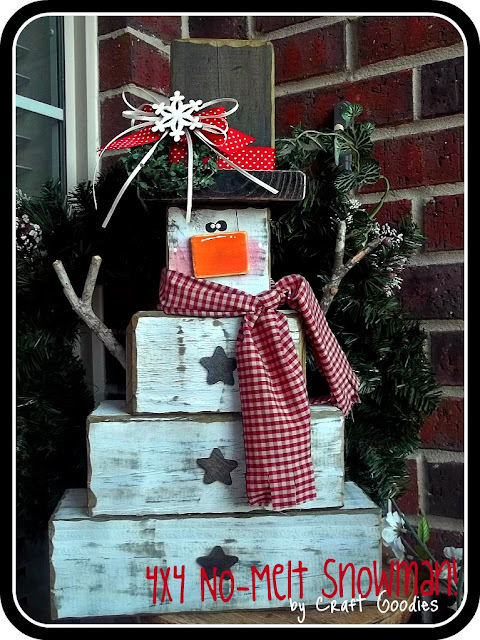 Get creative and enjoy making your wintry friend! Or go crazy and make a bunch, we all need a friend or two, right? Enjoy your holiday season and happy crafting. This is the project we will be doing. I have to admit the idea wasn't mine. I saw a version of it on a guest post done at Wood Connection and fell in love with it! It was super simple and looks so super cute on my front porch. The best part is my girls. 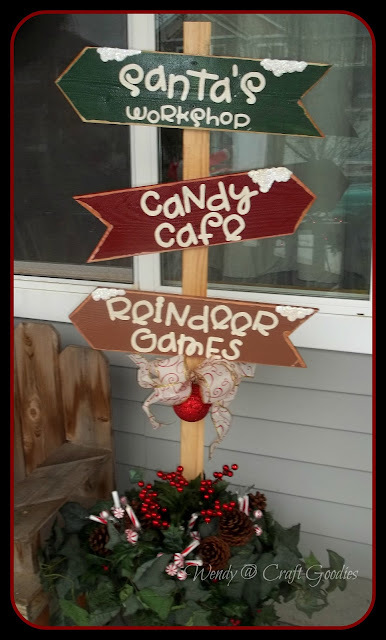 I overheard them the other day directing traffic--Halli you go see Santa, Reegan you can play the Reindeer Games, and I'll be at the Candy place! So funny, I love it! 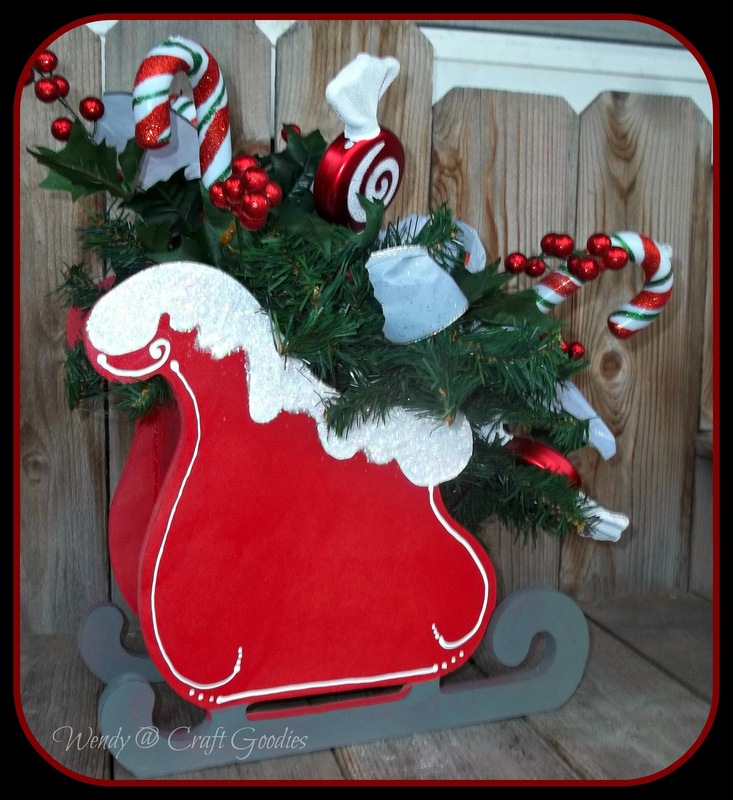 I wanted a fun centerpiece for my table that could last the season not just Christmas so this little sleigh was born. It's a box with the front and back pieces being the sleigh cutout. I debated setting a potted poinsettia inside but as I have a knack for killing them, I opted for fake instead. I made some for a bazaar several years ago and kicked myself for not keeping one. It's okay though, cause I have one now. It's made from pine 1x4's and a 1x6 rounded on the ends, a 1x2 across the front for braces, and 2 1x3's cut on an angle for the treads. Again, I thought about adding a live wreath but fake won out in the end. And last, I needed a new door decoration. I love the shape of vintage glass ornaments so opted for that. I cut it from 1/2 inch MDF and then made it pretty with paint, vinyl snowflakes, a little bit of greenery, and of course glitter! It coordinates with the wreath on the sled so my front porch is looking pretty darn festive. I smile every time I come home--I love this time of year! Wish my porch could be this happy all the time. I have a few more "updates" I want to share and of course the ornament exchange pictures will go up here in a day or so, so be looking for them. They are, like always, amazing.